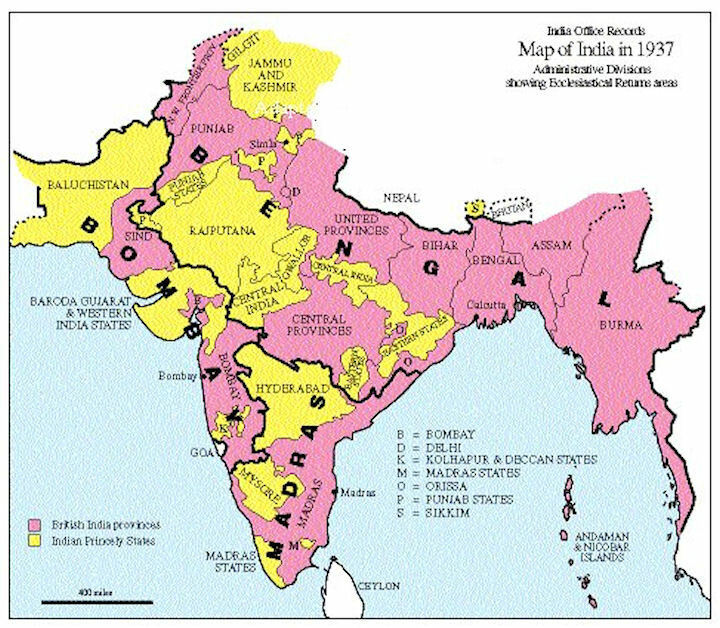 India had no native state so rich, potent and extensive as Hyderabad, which was about the size of the United Kingdom. Ever since Hyderabad had stood aloof from the great Indian Mutiny of 1857, its Royal Family had been accorded by British Royalty special honors and the Nizam had the official status of "Faithful Ally." This gracefully implied that his exalted highness was not so much the inferior as the colleague of His Majesty the Emperor of India - and, during the Great War, the "Richest Man in the World" contributed to Britain some $100,000,000 cash plus untold supplies and Hyderabad army units. During the troubled period of intrigue and assassination that followed on the death of Aurangzeb, Mohammedan foreigners rose to high positions as courtiers and generals, and succeeded in transmitting their power to their sons. The one was Chin Kulich Khan. His independence at Hyderabad in the Deccan dates from 1712. Chin Kulich Khan received the honorary title of Asof Jah, which, according to Muhammadan tradition, was the name of the minister of Solomon. But though he is often called Asof Jah he is best known by the title of Nizam-ul-mulk, or "regulator of the state," given to him on the accession of Farrukh Siyar; and as his successors, the Nizams of Hyderabad, were named after this title. Ethnologically, this area was inhabited by people belonging to different ethnic groups, with different religious backgrounds, customs, rites and rituals, and speaking different languages and dialects. There were marked disparities in the economic position of these groups. On the one hand was the aboriginal tribe of Gonds, occupying the lowegy rung of the social ladder; on the other were the Marathas, better placed economically and struggling for greater political and economic gains. Cotton, indigo and rice formed the buok of the agricultural produce. The area contained a number of diamond, silver and steel mines. Textile industry received a boost, and textiles became the main articles of export. In northern India, Akbar had not only been successful in consolidating the Mighal Empire, but had unleashed the forces of expansionism. He had swept one independent state after another, and with the conquest of Gujarat and Malwaj had touched the boundaries of the Deccan. His cordial relations with the Bathors and Kachhwahas had provided him a safe passage leading towards the region lying in the south of Narbada. Although, during the reign of Jahangir, the Mughals could not make any appreciable advance in the Deccan, the increasing Mughal pressure led the Deccan states to realise that sooner or later they would have to face and resist the Mughal onslaught with their full might. With the accession of Shah Jahan, the Mughal advance in the Deccan started anew. He pursued a vigorous policy. Daulatabad, the great fortress of the Nizam Shahi dynasty was captured in 1633 AD and Shah Jahan officially declared the Nizam Shahi state annexed to the Mughal Empire. But, this annexation did not represent the actual state of affairs, since over a large portion of the kingdom the Nizam Shahi officers continued to govern in the name of a new Nizam Shah. It was during the reign of Shah Jahan that Ahmadnagar was finally annexed to the Empire in 1636 and Mughal authority in the south entered a new phase of its development. Resistance in Berar came to an end intensive exploitation of the Deccan began. Major revenue reforms were introduced during this period, and significant changes were introduced in other spheres of administration. But by the year 1666, when Shah Jahan's grip over the Deccan became weak and ineffective. The Moghul empire waged war and defeated Golconda in 1687 and for about three decades Telangana was again witnessed chaos and fragmented rulers. The Viceroy's period of tenure was not fixed, but he was expected to retire within three years. This policy was adopted In order to keep him in check and eliminate chances of his developing local connections and strengthening his position against imperial interests. Distantly situated as the Deccan was, the ISmperor had perforce to the Viceroy greater freddom of action and initiative. The appointment of princes to the Viceroyalty of the Deccan was, in fact, intended to meet the dangers inherent in this situation. The regional tendencies of the South Indians resulted in the lack of mutual understanding between the Mughals and the Deccanis. It resulted in failure of the attempt to acccommodate the Deccanis In the imperial fold and ultimately proved harmful for the Mughals themselves. In 1712, Emperor Farrukhsiyar appointed Qamar-ud-din Khan as the viceroy of Deccan and gave him the title Nizam-ul-Mulk. He was later recalled to Delhi, with Mubariz Khan appointed as the viceroy. In 1724, Qamar-ud-din Khan defeated Mubariz Khan and reclaimed the Deccan suba. It was established as an autonomous province of the Mughal empire. He took the name Asif Jah, starting what came to be known as the Asif Jahi dynasty. He named the area Hyderabad Deccan. Subsequent rulers retained the title Nizam ul-Mulk and were called Asaf Jahi Nizams or Nizams of Hyderabad. The Medak and Warangal divisions of Telangana were part of their realm. When Asaf Jah I died in 1748, there was political unrest due to contention for the throne among his sons, who were aided by opportunistic neighboring states and colonial foreign forces. In 1769, Hyderabad city became the formal capital of the Nizams. Nasir-ud-dawlah, Asaf Jah IV signed the Subsidiary Alliance with the British in 1799 and lost its control over the state's defense and foreign affairs. Hyderabad State became a princely state among the presidencies and provinces of British India. A total of seven Nizam's ruled Hyderabad. (there was a period of 13 years after the rule of Asaf Jah I, when three of his sons (Nasir Jung, Muzaffar Jung and Salabath Jung) ruled. They were not officially recognised as the rulers. The relations of the British Government with the Nizam of the Dekhan, or Hyderabad territory, dated from the middle of the 18th century, and held a prominent place in the early history of the British empire in India. By the middle of the 18th Century the Nizam of Hyderabad ruled over a wealthy and extensive kingdom, and in recognition of his claim of suzerainty over the Garnatic had compelled the Madras Government in 1766 to sign a treaty acknowledging his authority, granting him a yearly tribute, and making an offensive and defensive alliance with him. Addressing himself first to the weakest of the three native Treaty powers, the Nizam of Hyderabad, in 1798 Wellesley won a diplomatic success, which turned a possible rival into a subservient ally. The French battalions at Hyderabad were disbanded, and the Nizam bound himself by treaty not to take any European into his service without the consent of the British - a clause since inserted in every leading engagement with native powers. By the treaty of 1801 the Nizam was bound to furnish a military contingent in time of war of 6,000 infantry and 9,000 horse. But the rabble Nizam's soldiery which he supplied during the subsequent wars proved to be worse than useless in the field. Accordingly it was agreed by mutual consent that a permanent force should be maintained by the Nizam, reduced to half the number of native troops, but to be disciplined and commanded by British officers. This new body of troops was known as the Nizam's Contingent, as distinguished from the Hyderabad Subsidiary Force. From a very early period the Nizam had failed to provide the necessary funds for the maintenance of the Contingent. From time to time large advances were made by the British government to meet the current expenditure, until a debt accumulated of half a million sterling. The Nizam might have escaped this obligation by disbanding the Contingent; but this he repeatedly and obstinately refused to do, and indeed the force was necessary for the maintenance of peace and order in his own territories. Again, he might have disbanded the hordes of foreign mercenaries, Arabs and Rohillas, which he kept up under the name of an army, and which were a burden upon his treasury, a terror to his subjects, and useless for all military purposes. But he was as obstinate upon this point as upon the other. At last, in 1843, he was told by Lord Ellenborough that unless the debt was liquidated and the necessary funds were provided regularly for the future, the British government would take over territory and revenue as security for the payment. By the treaty of 1800 the Subsidiary Force was to consist of eight battalions of infantry, two regiments of cavalry, and the usual proportion of artillery; and subsequently by the treaty of 1853 it was agreed that there should never be less than five regiments of infantry, with one of cavalry, and a due proportion of artillery stationed within the Nizam's territory, unless with the express consent of His Highness. By the treaty of 1860 the Hyderabad Contingent was not to consist of less than five thousand infantry, two thousand cavalry, and four field batteries of artillery. It will be sufficient to remark that the Nizam was in subsidiary alliance with the British Government, and could neither undertake wars, nor carry on negotiations, excepting by the permission or through the mediation of the British Government. The Government of India, however, abstained from any interference in the internal administration of the Nizam, who exercised sovereign powers within his own territory; but a British Resident was stationed at Hyderabad, who afforded such friendly counsel as occasion may require for the maintenance of a good understanding between His Highness's Government and the Government of India. A Subsidiary Force was maintained by the British Government at Secunderabad in the neighborhood of Hyderabad in accordance with the treaty of 1800. The Force, known as the Hyderabad Contingent, was also cantoned in different parts of the Dekhan, and maintained under the treaties of 1853 and 1860 by the revenues of the assigned districts known as the Berars. The largest of the armies of the Native States was that of the Nizam of Hyderabad, also a foreigner in the country belonging to him. It was so heterogeneous a body that it is difficult to state its numbers, but that part of it which may with some reason be called an army consisted of about 45,000 men by 1860. Many of these were foreign mercenaries from remote parts of India, and from the Afghan highlands beyond the northern frontier, who took service under the Nizam and his chiefs; they engaged in faction fights and raids within his territory, and had shown themselves ready to join any discontented men who may be willing to pay them for raiding into British districts. A considerable part of the Nizam's army had been reorganised and improved. While they perform no useful service to the Nizam, it was necessary to watch and overawe them, and the necessity was imposed on the treasury of always keeping a large force of British and Native troops at Hyderabad. By 1910 the district of Hyderabad - larger than the states of New York and Pennsylvania put together, and consisting of eleven and a half million inhabitants - was known as the "Nizam's Dominions," under the control of the Nizam of Hyderabad, a Musselman who, except the Sultan of Turkey, was the most powerful Moslem ruler in the world. Educated in England, the Nizam, although oriental in many ways, had broad, advanced ideas, and was loved and honored by the strange conglomeration of peoples that made up his subjects. Indian rulers such as the Nizam had only limited power in their kingdoms. Without the consent of the British Government they cannot declare war or peace nor enter into agreements with other states, although they retained a certain military force of their own. In the case of the Nizam's Dominions, however, no European but the British Resident may reside in the state without special permission of the Nizam; and there is no British interference in the government except in case of excessive misrule. Not only did the Nizam of Hyderabad issue his own coinage and stamps, but also collected customs at the boundaries of his territory. Soon after India gained independence, Hyderabad State merged with the Union of India. On November 1, 1956 the map of India was redrawn into linguistic states, and the city of Hyderabad became the capital of Andhra Pradesh.